After a flurry of books about battlefield ghosts, I'm back to the stack of magazines. I'm so close to having that stack gone, finished, recycled, that one of my goals to read books has sort of fallen by the wayside. There might be a dozen magazines in the stack now. I didn't count last night when I finished yet another one and tossed it into the recycling bin. But I thought I'd do a book review of the three books by Mark Nesbitt on battlefield ghosts that I read around the July 4th anniversary of the Battle of Gettysburg. The first review is of this one to the left. I ordered it from Just the Bookstore in Glen Ellyn and picked it up Friday after the Jeep was fixed so it would pass emissions testing. On Monday, I finished it. It's okay. It's a fairly quick read with chapters that are 3-4 pages in length. The battles he covers are arranged chronologically from 1861-1865. The problem with the book is that about three-quarters of the way through, it feels as if the author felt he had bitten off more than he really wanted to write about. When the book starts, there is an excellent synopsis of the major battles of the Civil War. Detailed descriptions of these battles are for other books. He's concerned with where the armies were, where they moved during the particular battle and where the deadliest fighting occurred. I found his synopsis, at the beginning, to be very well done. The problem, if you haven't guessed by now, is that Nesbitt seems to lose steam or desire for the concise descriptions of the battles that he starts with. In setting the stage for the ghost stories he's going to relate, it just seems as if he decided he was being too wordy before and he needed to pare down the descriptions. While I didn't read the book for a description of the battles, they way he presents the battles early in the war help put the ghost stories in context. Plus, he leaves out the Petersburg campaign entirely. I cannot believe he has no stories from the siege that produced "The Crater" and which saw a black regiment severely decimated by Southern troops. They took out their anger about the war on those soldiers, killing any black soldier they could find even those who attempted to surrender. You would think the trench warfare of this campaign would produce all sorts of stories. Sherman's March to the Sea is also curiously absent. The emotions, which still run raw, about this march and what Sherman did to the south would certainly have produced ghost stories. If there are any, Nesbitt doesn't include them. There are stories from Chattenooga and Kentucky. We tend to forget that the Civil War was fought from Gettysburg to Mobile, from Charleston to Texas. Iowans were in Arkansas. Every battle produced casualties and while a detailed battlefield book is not what this purports to be, I was quite surprised that he left out two major events. The ghost stories related are of the usual kind. They weren't particularly scary. If you want to be scared, you need to read his Ghosts of Gettysburg series. I had high hopes for the Ghost Trails books because of the other series. Nesbitt was a ranger at Gettysburg National Battlefield and knows that area extremely well. It shows in the attention to detail of the stories he collects. Some of the stories in the Gettysburg book made me shiver. There's the bed and breakfast across the street from the house where General Lee had his headquarters. One chilly fall evening, the owner went to the wood pile to get an armload of wood. He picked up the wood and heard sounds that could only be described as cannon fire. They were coming from the far end of the open field behind the inn. As he looked across the field, he saw shadows form and start moving towards him. They took on the shape of men. This would be Union soldiers who were routed from their positions and fled back into and through Gettysburg. He attempted to step aside as he saw a soldier running towards him but the shade ran right through him. At this point, he dropped the wood and fled back inside. When he told his wife what had happened, she said she had been in the back office doing paperwork when she saw what looked like men running past the inn. She couldn't see any detail on them. They were all shadowed but it was quite clear they were running through the side yard. With the ghost stories in the ghost trail book, there isn't this attention to detail. More space is given over to Nesbitt's attempt to communicate with reported ghosts than with the actual reports from people of what they have experienced. He uses a digital tape recorder set on voice activation. He goes to a battleground and asks general questions to the air and hopes that he gets something in return. I don't find these kinds of stories as chilling as the stories of people having encounters they cannot explain. I can't believe there aren't stories out there. 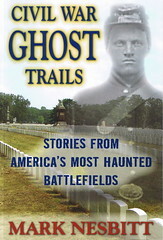 The only story from the ghost trails book that gave me chills was the story of the Carter House in Franklin, Tennessee. Tod Carter fought for the Confederate Army and was in sight of his boyhood home when he was shot 9 times. His men carried him from the field of battle into his home where he died. The Carter farm is now a museum detailing the battle and life on the farm. One day, right before closing, a thin man in wool pants, scuffed shoes and a cotton shirt showed up at the museum and asked for a tour. The museum director took him around. She became increasingly irritated when this man would politely correct her on numerous aspects of the battle fought around the farm and on the lives of the family who lived there. They headed to the cellar where she was to give a presentation on how the family stayed in the cellar during the battle. The young man became agitated and said they weren't allowed in the cellar. She assured him that it was okay. She turned on the light to go down the stairs and he vanished in front of her. A week later, as she was going through family photos for an exhibit, she found a photo of the man she had given the tour to. It had been Tod. No wonder he knew about life on the farm. 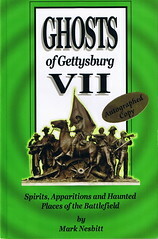 Nesbitt has changed the focus of the Ghosts of Gettysburg books just a bit. He looks at these stories with a somewhat skeptical eye. There is no doubt, to him, that something is going on in places where life was violently removed from so many. For himself, as much as for anyone else, he wants some sort of tangible proof in this, that what someone experiences is real. I remain skeptical of the tape recorded sounds. Poltergeist activity; the moving of items, slamming of doors, touching, shoving, etc; can be more solid proof, as is auditory sounds of battle when there is nothing visible. People report the smell of rotten eggs, a remnant of the sulfur that was used in ammunition, or the smell of smoke. Nesbitt reports people who visit The Wilderness battlefield often smell smoke. The woods caught on fire several times during the battle which lead to many deaths as men who were wounded and couldn't move were burned alive. He mentions that only 10% of paranormal encounters are with full specters as the guide had at the Carter house. A full 60% are of the poltergeist nature and the rest are auditory or olfactory. He's not very fond of the ghost "hunters" on television. He believes you don't hunt for ghosts. You just happen to be in the same space as them. They determine whether they will reveal themselves to you. And these "hunters" are looking for a full spectral manifestation, ignoring how most incidents occur. He's even less happy with people who show up in packs with their meters and infrared cameras. Controlled, almost scientific, investigations are what he's doing now, what he's reporting on now and he feels these packs of would-be investigators erode the credibility of those who are trying to solve the mystery of what people experience in these locations. He was polite but not charitable to the TV program he found himself involved with because they did not show all the prep work he and those he works with do prior to an investigation. The TV program was disappointed when they didn't get a ghost on film and only got noises even though that's the way most ghosts manifest. 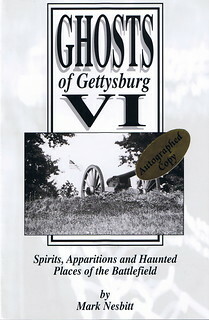 If you are interested in purported real-life ghost stories, pick up the Ghosts of Gettysburg series. You can get them as e-books now, if you read on one of those devices. The Ghost Trails book can be summed up thus, "Battlefields can have ghosts. If you visit one of the Civil War battlefields or a house or building that was associated with the Civil War, you have the potential to have an experience you can't logically explain." Beyond that, it's really not worth the money to buy.